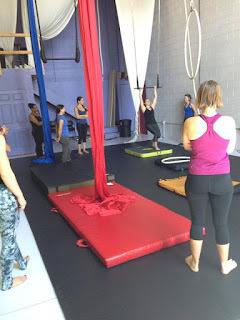 One of my long time students who is a professional aerial artists asked me to come to her aerial studio to teach a workshop for her flying students about Anusara Yoga's Alignment Principle, Shoulder Loop. I broke down shoulder loop: why it is important, how to do it, what it feels like when your doing it, what it feels like when your not doing it and putting it in to practice. In between my teaching Elizabeth Stich guided the students in different apparatuses (trapeze, silks, lira, and rope) going over basic skills (they did not look basic!) while adding in this alignment principle. Elizabeth demonstrating Side bodies long and inner body bright. I am so grateful to have been apart of this experience. It was amazing to watch these strong women take in this new information, digest it and put it into practice in the air. They are so strong and graceful. It was so clear to see when they were and were not doing shoulder loop and how much more ease it looked like it added to their movement. Before we started class we went around and everyone introduced themselves and shared their current or past history with shoulder injuries. Almost every student had or has a shoulder issue! That is one thing I love about Anusara Alignment! It brings the body into "optimal alignment' which heals past injuries and helps prevent future injuries. This alignment can be practiced in class and also during daily activities like driving, holding children, cooking...After the class some students commented that they didn't understand the whole concept of shoulder loop. I reassured them "That is totally normal! I have been studying this for 8 years and I am still discovering more and more!" I said as long as you leave learning something that is a success and more will be reveled if you continue to practice. Shoulder loop is one of the seven loops on Anusara yoga. It starts in the upper palate, flowing backward to the base of your skull, draws down to the bottom of your shoulder blades and then the shoulder blades go in and up to the heart and ends where it started at your palate, lifting your chest and opening your throat. Releases the tension in the neck, stretches the chest, strengthens the back and makes room for more breath. Shoulder loop also aligns your arms with your shoulder joints, stabilizing the collarbones and shoulder blades. The loop gives your shoulders the widest range of motion without risking injury to your neck or shoulders. The aerial students were very excited about this last function. By integrating these movements of your shoulders, the loop aligns and opens your shoulder girdle and chest. 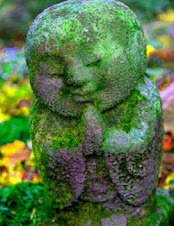 These combined actions result in opening the space of your heart. Before doing these steps Open to Grace by lengthening the Side bodies and expanding the inner body bright which will broaden the collar bones. This will bring the body into a natural place to take shoulder loop. Now... draw the head of the arm bones back, slide your shoulder blades down your back, press the lower tips of your shoulder blades forward into the bottom of your heart and lift your chest, slide your throat back so that your head and neck are aligned with the central axis of your body. Feel how magical optimal alignment is! Shoulder loop: starts in palate of mouth draws back and down skull, draws shoulder blades down and forward to lift heart and then comes back up to meet in the palate of the mouth. Repetition it's the same alignment in every pose. 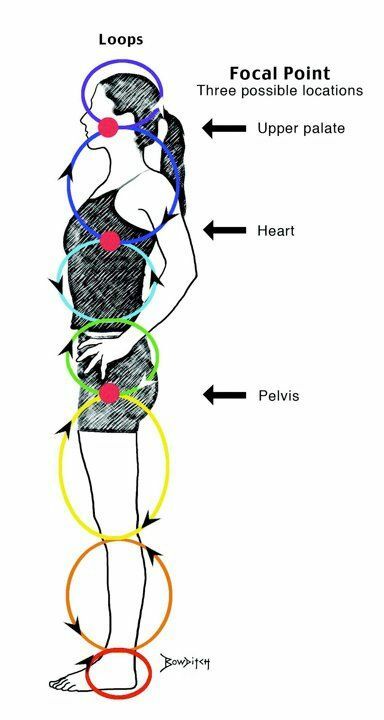 Optimal alignment in Tadasana and in real life is what we are building in every pose.